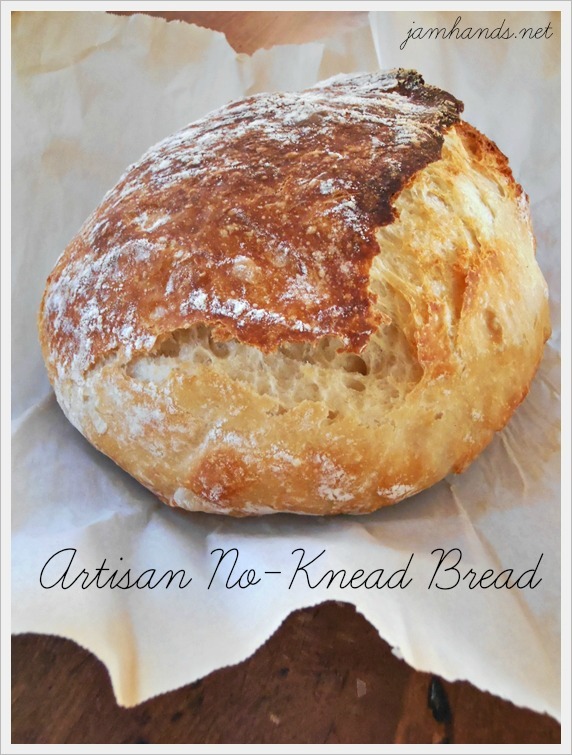 I am kicking myself for not trying the famous 'no knead' bread that has been talked about the last few years. I tried it out and I am here to tell you guys that this recipe is fantastic. It comes together so quickly that it is hard to believe such great results can be made, but believe it! This recipe came from the blog Simply So Good. If you would benefit from step by step photos, or browsing the hundreds of comments regarding this recipe, head on over to Simply So Good and check it out. -I add 1 Tbsp. sugar to my dough. 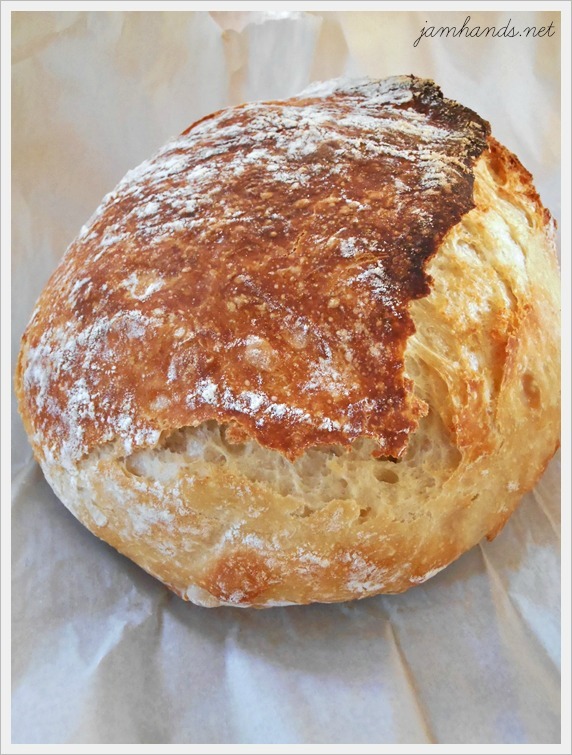 I read a comment at another site where a reader mentioned she adds sugar to get the bread to rise higher. I am not a professional baker so I can't vouch for how how legit this tip is, but I added sugar and my loaf turned out wonderful and rose well, so I add it. 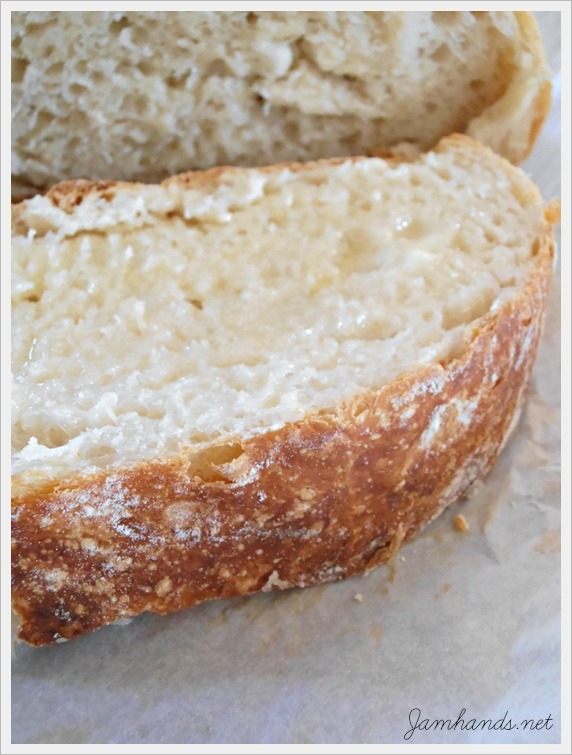 -I use parchment paper so that the loaf can easily be lifted out of the pan. -The time for letting the dough rise is lenient. I make the dough sometime in the late evening and bake it sometime in the late morning. 1. In a large mixing bowl, whisk together flour, salt and yeast. Add water and mix until a shaggy mixture forms. Cover bowl with plastic wrap and set aside for 12 - 18 hours. Overnight works great. 2. Heat oven to 450 degrees. When the oven has reached 450 degrees place a cast iron pot with a lid in the oven and heat the pot for 30 minutes. 3. Meanwhile, pour dough onto a heavily floured surface and shape into a ball. Cover with plastic wrap and let set while the pot is heating. 4. Remove hot pot from the oven and drop in the dough. Cover and return to oven for 30 minutes. After 30 minutes remove the lid and bake an additional 15 minutes. Remove bread from oven and place on a cooling rack to cool. Recipe from Simply So Good. 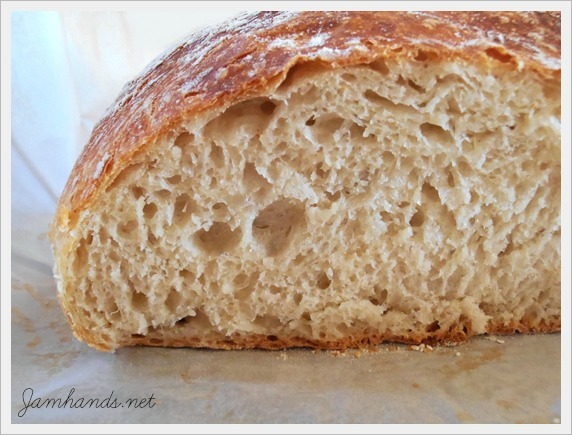 If you have a Deep Covered Baker from the Pampered Chef, it works great for this type of bread recipe. I would be afraid to use the Pampered Chef because of the high temperature. Wouldn't it crack?? PC Deep Covered Baker shouldn't be preheated empty. However, you can use it for baking up to 450. Or if you're not willing to tempt fate, turn the heat down to 435 or 440. Since there are only 2 of us I use the Pampered Chef small baker and cut the recipe in half. Works great and I do it at the 450 but don't preheat it. I do use parchment paper in it but have wondered if it is really necessary. 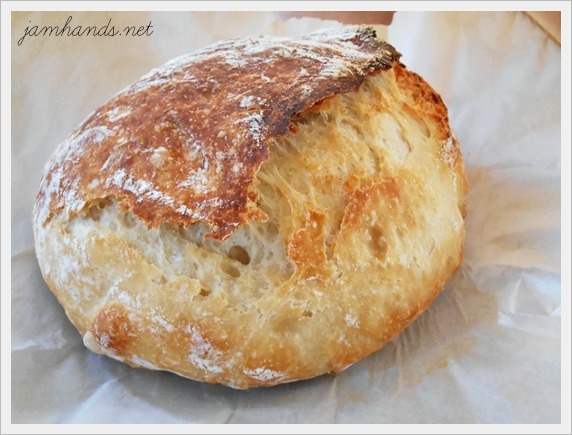 LOVE no-knead breads. Yours looks beautiful. Wow, this looks so good! I'd be very content with this bread, some cheese and wine. Perfect! Your loaf looks perfect! Can't wait to try this recipe. Looks so good and so easy. I love bread! Hi Sheryll - I am not familiar with caldero. When I googled it it seems like some of the pans have knobs on the lids, so you would have to make sure you have no plastic or other oven unsafe knobs. If there is any worry of the bread sticking just slip in a sheet of parchment paper and you should be good. You want a tight fitting lid. My 12 hour bread turned out really good. Slightly underdone, but that's only because I cleaned the #'s off my oven temp knob and guess as close to the right temp as possible. 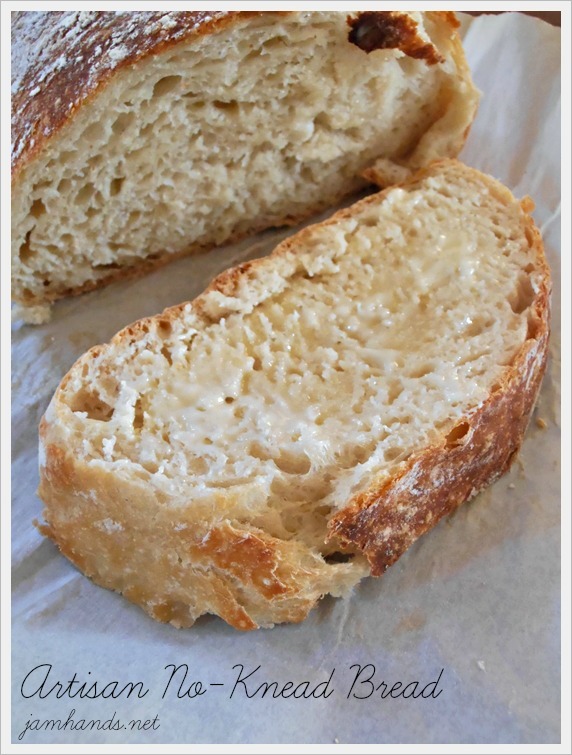 :-) Definitely rustic and crusty with a good taste. I will definitely make again and try the pizza artisan version as well on this site. Only thing was I was looking for a bread recipe that I could break off into rolls or bread sticks when desired, but this dough is really sticky to work with in that manner. I am too lazy to mess with it like that. Oh, I used my 5 qt crockpot insert with foil on top to bake the bread in. I did not have parchment paper so improvised with a silicone cookie baking liner. Someone gave it to me so can't be sure if the temp was too high for it. It smelled a little plastic-ky while baking, but did not melt and the bread was fine. This just came out of the oven and I cannot wait to cover it in butter or my homemade jam and sink my teeth into it! I have made this recipe numerous times. Liking the crunchy crust I have used a scoop to make 6 smaller round loaves. This way your fingers do not get sticky dough on them. And the small loaf is just right for 2. I have froze the loaves as well. Good recipe.